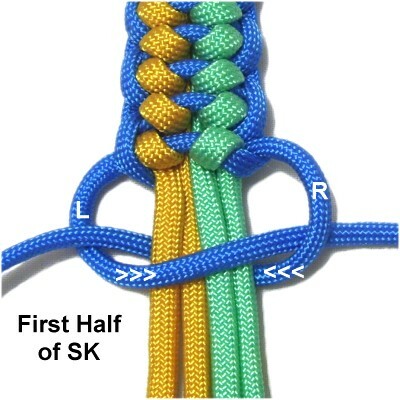 Description: The Split Spine Bar is a unique way of using Square knots combined with extra loops. It features contrast stitching that is slightly slanted and close to the right and left edges of the sennit. 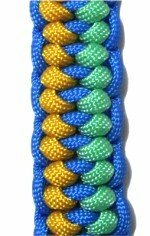 When making a Macrame project with this interesting technique, use at least two colors for contrast. 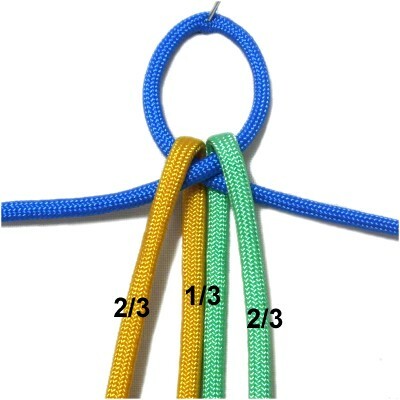 In the example shown, Paracord material in three colors was used. 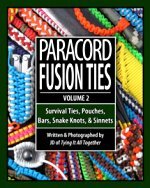 Be sure to read Cord Preparation to learn how to prepare Paracord properly. 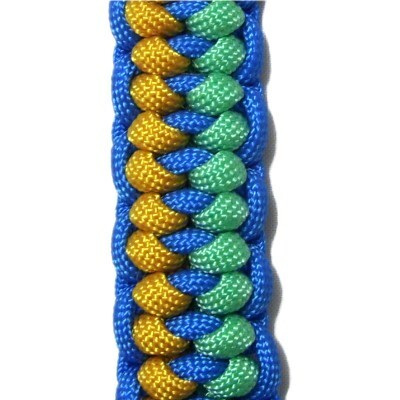 This design is listed on the Fusion Knots website. Click on the image or link to visit the website. 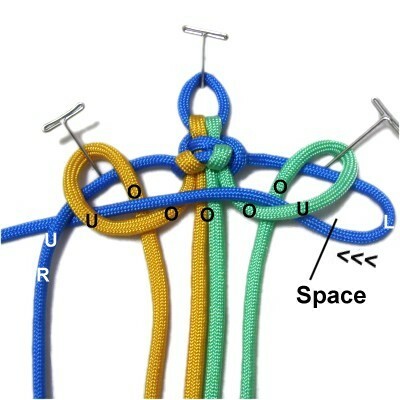 The video gallery contains tutorials for a wide range of unique combination knots. To practice the Split Spine Bar, you need 3 cords at least 60 inches long (one working cord, 2 fillers). When using it in a project, the WORKING cord needs to be at least 12 x the finished length you are trying to make. The FILLERS can be approximately half the size of the working cord. Make them longer if you plan to tie a button knot to create a clasp. 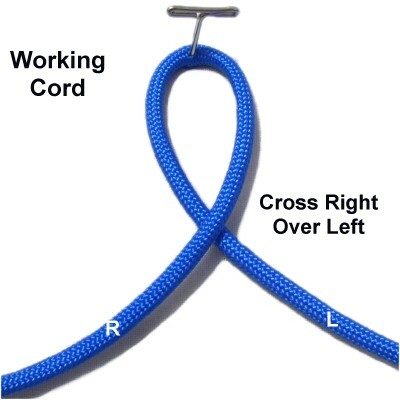 Step 1: Make a loop with the working cord, crossing right over left. Fold the filler cords and arrange them around the crossing point of the loop. Make sure that 2/3 of the material passes over the front of the crossed area. The remaining 1/3 passes beneath the crossed area. Move the long segments beside the short portions. 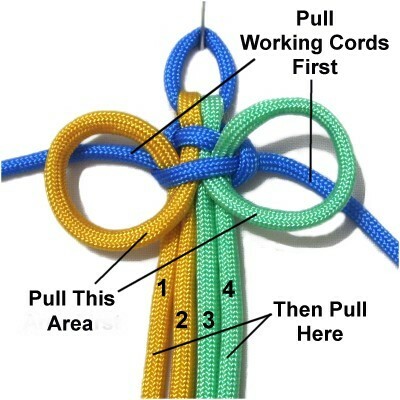 Step 2: Start the first half of a Square knot by curving the left half of the working cord horizontally to the left. Pass it over the fillers and under the right half of the working cord. Move the right half of the working cord under the fillers, heading right. As you pull it out on the right, pass it over the left half of the working cord. 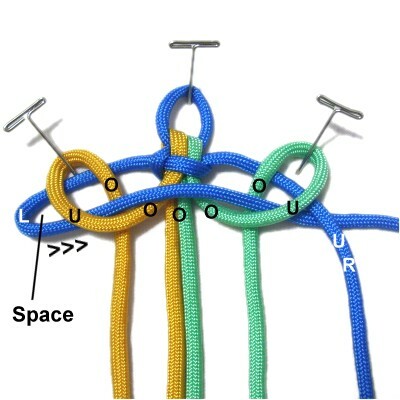 Tighten the knot and adjust the size of the loop. The front half of the fillers are used to form the loops, which is why they are longer. The back half rest between them. After tightening each knot, arrange the front half of the fillers so they rest on either side of the back half. When you curve and weave the working cords, keep the design wide so you can see all areas. 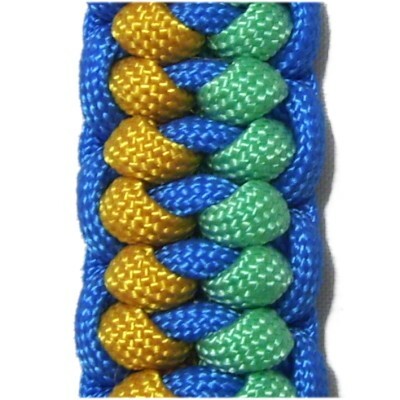 Each half of the Square knots begins with the loops and ends with tightening. From this point on, the two halves of the working cord are considered two separate cords. Mentally label the four fillers as shown in the image below. The long portions should be labeled 1 and 4. Step 3: Make a clockwise loop with filler cord 1, placing it on top of the left working cord. 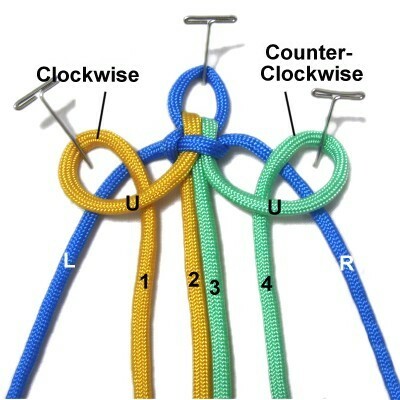 Make a counter-clockwise loop with filler cord 4, placing it on top of the right working cord. Important: Pass under to form the crossing points of both loops. Step 4: Curve the left working cord to the right, leaving some space between the curve and the left loop. Pass it through the left loop under - over. Bring it over all the segments in the center area, and through the right loop over - under. Pass it under the right working cord (outside the loop). Designer's Tip: The best way to secure the loops for the Split Spine Bar is to lean a pin backward over the crook (roundest area). When it comes time to tighten the loops, you can just lift them up over the pins. Move the right working cord to the left, passing under all four filler cords. Pass it through the curved area of the left working cord under - over (from below). The first half of the SK is finished. A. 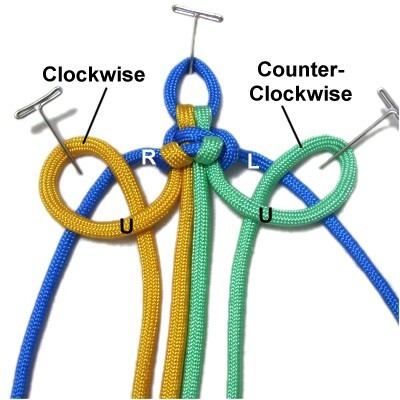 Pull the working cords to tighten the Square Knot. B. 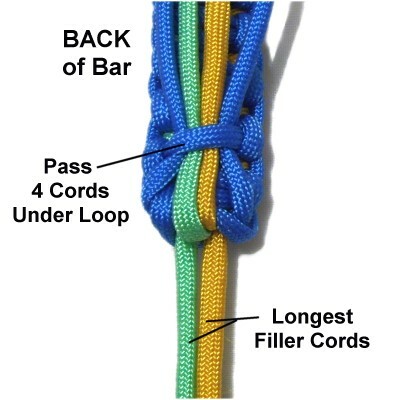 Pull the loops in the area close to the Square Knot. C. Pull filler cords 1 and 4 to tighten the loops FIRMLY. 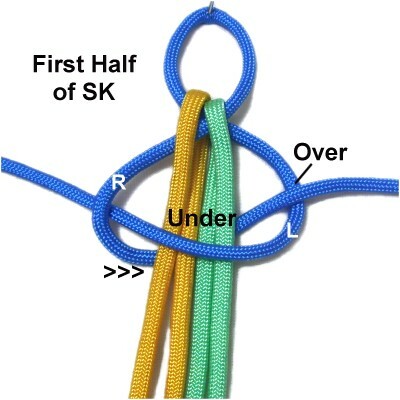 Important Tip: The reason why you pull the loops in the area close to the SK is to make sure there is no slack between them, so they rest close together. 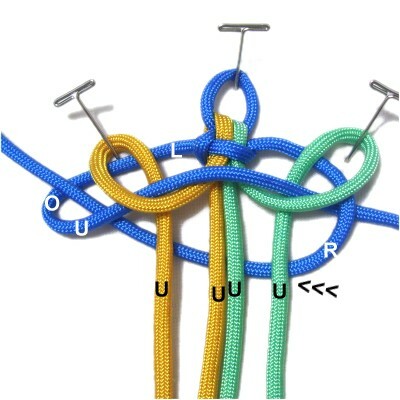 As you progress, make sure the loops you are tightening are touching the previous loops, like you see in this image. The Clockwise Loop rests on the right working cord. The Counter-Clockwise loop rests on the left working cord. Curve the left working cord to the left, leaving space between the curve and the right loop. Pass it through the right loop under - over. Bring it over all the segments in the center area, and through the left loop over - under. Move the right working cord to the right, passing under all four filler cords. 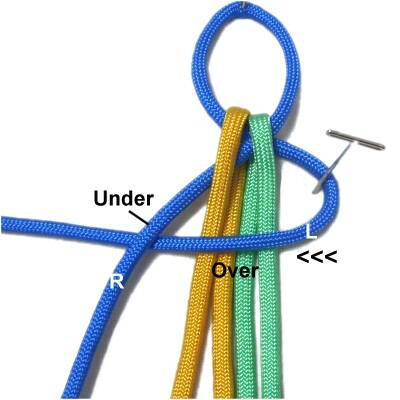 Repeat step 5 to tighten the Square Knot. 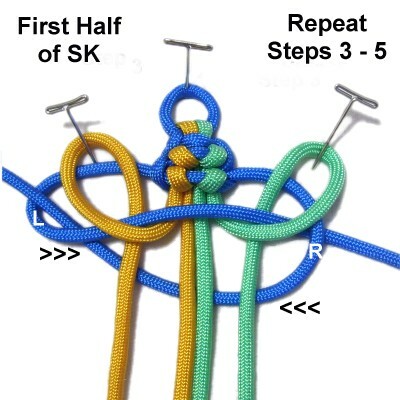 Step 7: Repeat steps 3 - 5 to make the first half of the next Square Knot. 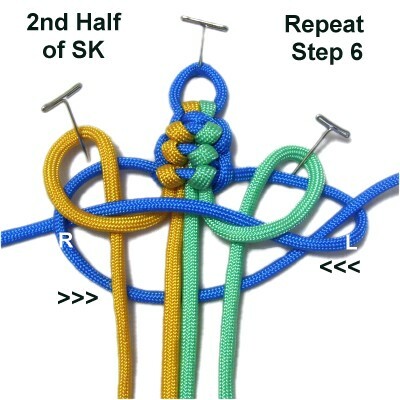 Step 8: Repeat step 6 to make the second half and complete the SK. Split Spine Bar is the length you need for your project. When practicing, it can be any length. Move the left working cord over the 4 fillers and under the right working cord, heading right. Move the right working cord under the fillers and over the curved area of the left working cord. 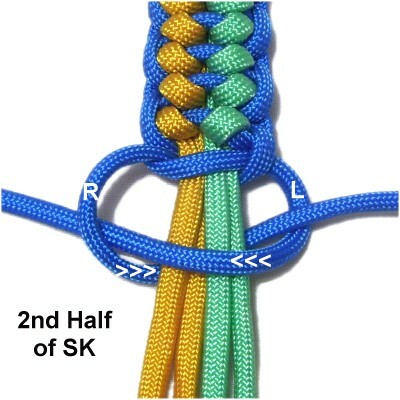 Tie the second half of the SK by moving the left working cord over the fillers and under the right working cord. Move the right working cord under the fillers and over the curved portion of the left working cord. Step 10: Finish off the ends of the working cords and the two shortest fillers by passing them under a loop in the BACK of the Split Spine Bar. The longest filler cords can be used as part of a clasp (see next image), or they can be finished off, too. 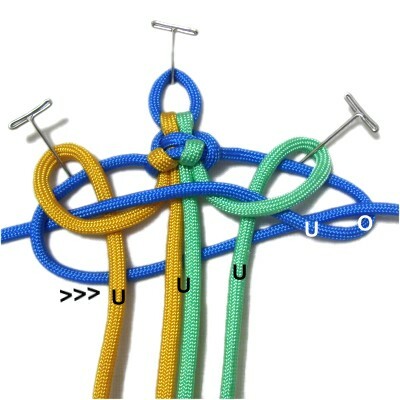 To make a clasp, you can tie a button knot with the two filler cords. 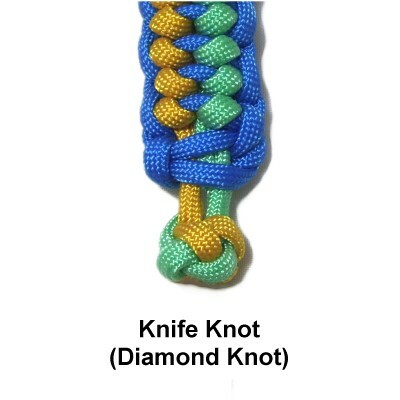 The Knife Knot (Diamond Knot) is a great choice, since it can be made with two cords. Have any comments about the Split Spine Bar? Contact Me.